We offer Haircuts and Colors, Event Hair, Organic Facials, Beyond Botox Facials, Make up, Reiki & Massage. We are a family salon for men, women & children. We offer complementary herbal teas , coffee, wine, beer, soda and our favorite for the kids juices boxes and while your waiting. You can sit by our beautiful fire place. 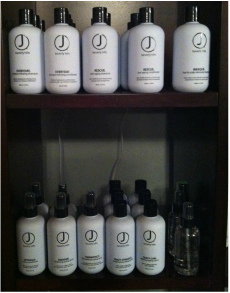 The products we use are all organic, Loma & J. Beverly Hills. We also offer botox parties..check back often to see our specials. We love being apart of a great community here in Granby, CT.
Are high performing with naturally healing ingredients and essential oil based fragrances. and all products are good for your hair and skin! JBeverly Hills® was created by Juan Juan, celebrity stylist and founder of the Juan Juan Salon – a Beverly Hills landmark. J Beverly Hills is a premier producer of hair and colour products that are available only through the finest professional salons. ​​B. Kamins is a modern spa line that fuses the visible results of clinical skincare with the luxurious experience of a spa visit. With 40+ years of experi- ence as a dermatological chemist, Mr. Kaminsky has developed and registered numerous prescription and over-the-counter pharmaceutical products making B. Kamins pioneers in the treatment of sensitive, damaged, and hormone-deprived, mature skin.